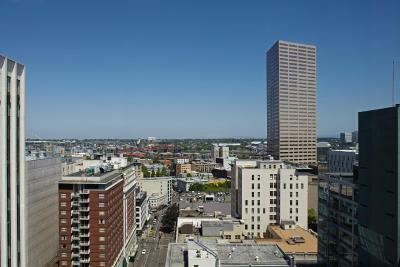 Lock in a great price for Portland Marriott City Center – rated 8.6 by recent guests! The location is great. Convenient to shopping and restaurants. The VIP lounge is not what we expected. Small room on the top floor. Only soda and water for refreshments and goldfish and chips for snack. We were hoping for more of a lounge. The staff is really friendly and helpful. Also we checked in early and checked out late free of charge. Clean, spacious room. Nice, hot shower with quality soap and shampoo product. Felt very safe. Great location. The room was clean and updated. The staff was extremely friendly and helpful. close to many amenities. The staff was friendly enough. That's about it. I really liked the security they had for their elevators. The beds were comfortable as well. The staff was really wonderful. What stuck out to me was the valet and attendant's while waiting to get checked in. They really went above and beyond. The location is very nice and overall the hotel itself was very clean. From the time you step out of your vehicle, you’re greeted with Cameron And Colman they both make you feel so welcome .. which is important because that’s the first people you See! And than you Ck in, and you’re greeted by Tyler Allen Amazing customer service ..
From the time you pull up to valet Till the time you have to check out, you provide the most amazing experience with your excellent customer service ! Very friendly & helpful valet and concierge staff. Reading lite on headboard nice touch. Close to coffee shops and eateries. Portland Marriott City Center This rating is a reflection of how the property compares to the industry standard when it comes to price, facilities and services available. It's based on a self-evaluation by the property. Use this rating to help choose your stay! Located in the heart of downtown Portland and within walking distance of Pioneer Courthouse Square, this Portland hotel features a gym. The Oregon Zoo is 2.8 miles away and guest rooms include cable TV with HBO. The property is 4 blocks from the Southwest 10th & Alder MAX station. Each spacious room at the Portland Marriott City Center is furnished with coffee facilities and flat-screen TVs. Pay-per-view movies are also available. 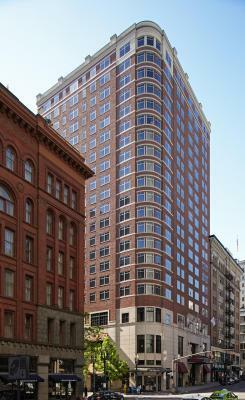 City Center Portland Marriott includes the Mez on Broadway restaurant. It is open for breakfast, lunch and dinner. For added convenience a business center and laundry facilities are also available. Less than one mile away is the Lan Su Chinese Garden. Marriott Portland City Center is 12.3 miles from Portland International Airport. This is our guests' favorite part of Portland, according to independent reviews. This property also has one of the top-rated locations in Portland! Guests are happier about it compared to other properties in the area. This property is also rated for the best value in Portland! Guests are getting more for their money when compared to other properties in this city. When would you like to stay at Portland Marriott City Center? This air-conditioned room features a flat-screen cable TV with pay-per-view channels, a work desk, a seating area, a refrigerator and a coffee maker. A roll-away bed is available upon request. Public parking is available at a location nearby (reservation is not needed) and costs USD 39 per day. Featuring panoramic city views, this air-conditioned room features a flat-screen cable TV with pay-per-view channels, a work desk, a seating area, a refrigerator and coffee-making facilities. Featuring a hot breakfast Monday through Friday and Snacks all day during the week, this room offers access to the Concierge Lounge. A buffet breakfast in the hotel restaurant DEN is offered on weekends. This spacious air-conditioned room features a flat-screen cable TV with pay-per-view channels, a sofa bed, separate living room, a refrigerator, and a coffee maker. Located on a high floor level, this king room features expansive views of the Portland skyline, a cable TV, air conditioning and seating area. This double room has air conditioning and executive lounge access. A buffet breakfast in hotel restaurant DEN is offered on weekends. The Marriott Portland City Center on Broadway is located in the heart of the city. Our "boutique" style hotel offers 249 rooms, 3500 sq. ft event space, Den and Private Dining. Whether traveling for business or pleasure we are the perfect choice! House Rules Portland Marriott City Center takes special requests – add in the next step! Other Portland Marriott City Center accepts these cards and reserves the right to temporarily hold an amount prior to arrival. Portland Marriott City Center accepts these cards and reserves the right to temporarily hold an amount prior to arrival. Air quality in room, Very stuffy. The beds were double beds, rather than queens. We were cramped and didn't have a great sleep. I've never had a double bed in a hotel before, we usually get queen beds with a family of 3, but no queens available in this hotel. Bed was quite hard. No free WiFi. Location. Very clean and posh. the weather was too cold to venture far into Portland. It was $6 a night for wifi, our view was of a brick wall, and for how much it cost there was next to nothing in terms of convenience or amenities. Really meh experience all around, would not recommend. There was not juice or healthy beverages from the vending machine or the evening snack store. Which is / was pleasant to have in the first place. Friendly, knowledgeable staff. Easy check in. Room was clean and spacious. I called beforehand to ask some questions and the person who answered was not the most pleasant. Also the room had a bit of a stuffy smell without a way to open windows and air it out. The staff is amazing had breakfast there . Food was great ! Here again amazing customer service !! There’s not much customer service anymore !! I love how they all go out of their way for Their customers !! Room had a view of all rooftop machinery which we could here from our room. View outside was like looking inside a chimney flute for $249 a night. Front desk no help.